The Beulah Show (1951): Academy Award and Emmy nominee Ethel Waters stars as the down-to-earth housekeeper with a twinkle in her eye. This episode features guest appearances by Dooley Wilson as Beulah's boyfriend Bill and Butterfly McQueen as her chum Oriole. 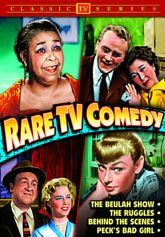 The Ruggles (1952): Popular entertainer and screen favorite Charlie Ruggles plays a fictionalized version of himself in this classic sitcom, as an entertainer trying to balance career and family. Behind the Scenes (1959): Aspiring actress Sally Smith decides she's going to turn her attention to screenwriting, but when her script is accidentally switched with the one being written by the screenwriter next door, she and her roommate Jill Butler suddenly find themselves taking meetings with Hollywood agents and studio heads�and making demands that will turn Tinseltown upside-down! Starring Sally Fraser, Jil Jarmyn and Jesse White.